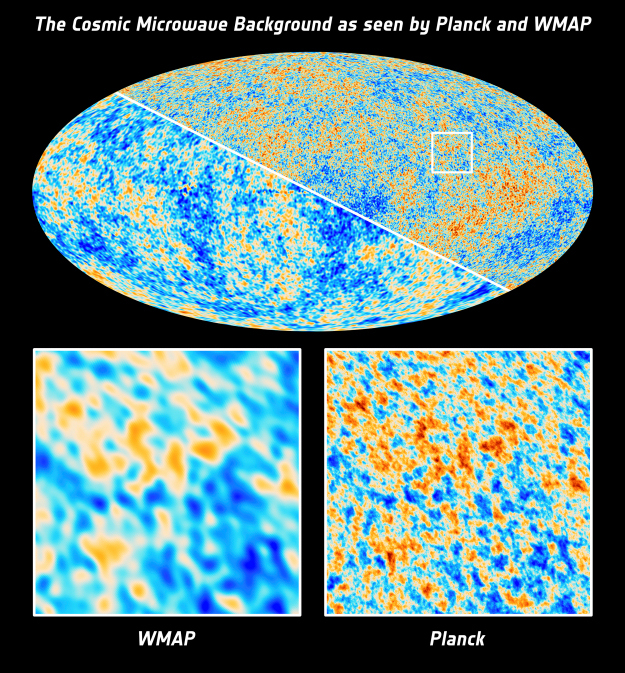 This image shows temperature fluctuations in the Cosmic Microwave Background as seen by ESA's Planck satellite (upper right half) and by its predecessor, NASA's Wilkinson Microwave Anisotropy Probe (WMAP; lower left half). A smaller portion of the sky is highlighted in the all-sky map and shown in detail below. With greater resolution and sensitivity over nine frequency channels, Planck has delivered the most precise image so far of the Cosmic Microwave Background, allowing cosmologists to scrutinise a huge variety of models for the origin and evolution of the cosmos. The Planck image is based on data collected over the first 15.5 months of the mission; the WMAP image is based on nine years of data.